WellShare has partnered with the Karen Organization of Minnesota (KOM) since 2012 to engage the local Karen community, and those that serve them, in culturally-specific health education. Since 2014, this partnership has included utilizing a co-authored Reproductive Health and Health Care Access curriculum to facilitate oral and activity-based community learning in the Karen language. On Friday, April 8th we celebrated the graduation of our first 2016 “Karen Health Group”. 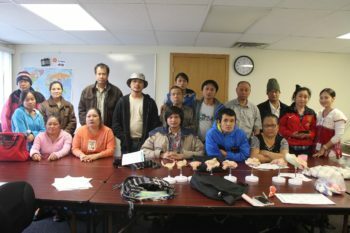 A total of 23 Karen community members participated in at least one of the five free learning sessions hosted at KOM in Roseville, MN. Learning sessions were held for two hours on Fridays, starting in early March. Participants were provided transportation to and from classes as well as an array of healthy snacks. The group was facilitated by Julyna ‘Law Law’ Loo (pictured at left), a Community Health Coordinator at KOM contracted by WellShare. A total of 10 interactive lessons were taught with topics from Reproductive Anatomy Basics, Understanding Puberty and Supporting Teens, and Family Planning, to Patient Rights and Responsibilities, and Health Providers and Emergencies. Attendees ranged in age, marital status, length of time in the U.S., and many other factors, yet all actively and joyfully participated in class learning activities and discussions. Additionally, participants consistently indicated improved understanding and knowledge in pre- post-evaluations administered for each lesson, as well as offered valuable insight to further strengthen our programming during a midpoint check-in. Those that participated in the recent graduation celebration are pictured below. Additional Health Groups will be conducted throughout the year at various community locations. This partnership and program is generously funded by the Minnesota Department of Health, Family Planning Special Projects grant.